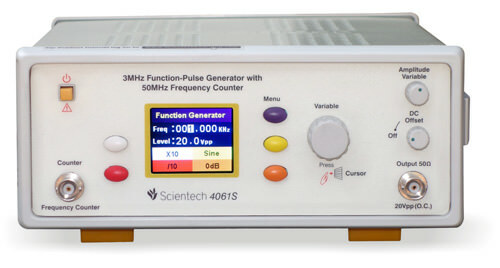 New 3 MHz Function - Pulse Generators, Scientech 4061 & Scientech 4062 with Digital Readout backlit Color LCD display, fullfil today's demand of electronics laboratories in universities, colleges and training centres. They have all ! 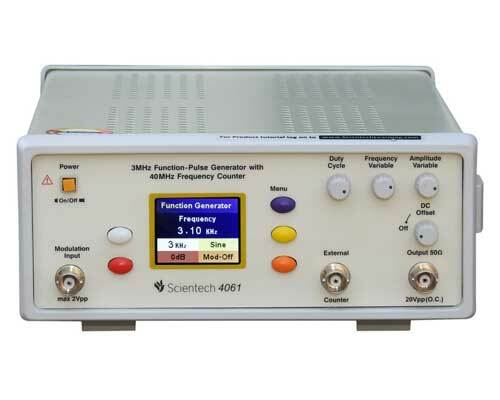 whether you need Pulse and Ramp in addition to Sine, Square, Triangle over the frequency range of 3/10 MHz, or you need internal and external AM-FM or internal sweep, or PWM. The series have all and also TTL Output. 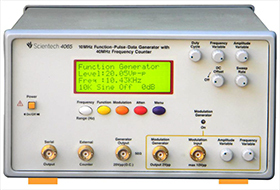 It has separate operations for function, frequency, modulation, attenuation and Frequency Counter. Pulse duty cycle and sweep time are variable. AM standard and AM balanced modulation are done with great accuracies showing clearly the depth of modulation. Attractive sleek design makes this new series an ideal choice for modern laboratories.